Today in History–April 15–the Library of Congress features tax day, the day on which income taxes are usually due each year. Although the United States raised revenue through taxes from the beginning—early taxes were levied on whiskey and tobacco—income tax was first levied from 1862-1872. It was again instituted in 1894 for a year before the Supreme Court ruled the congressional levy unconstitutional. It would not be levied annually until after the passage of the 16th amendment in 1913. 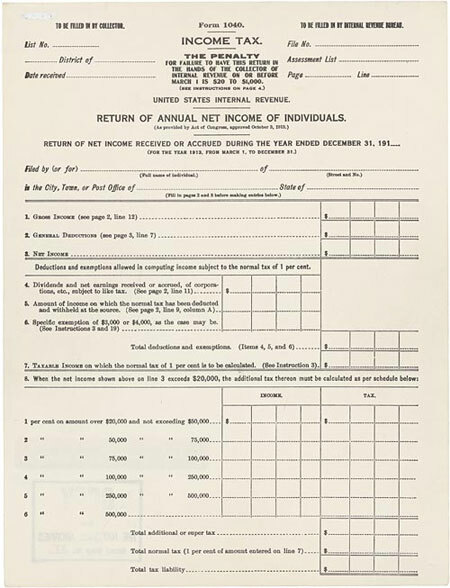 Learn more about the history of U.S. income tax by visiting the Today in History section and access all sorts of tax-related primary sources by clicking the links below. And Happy end of tax season to my two favorite CPAs: my Dad and my sister!